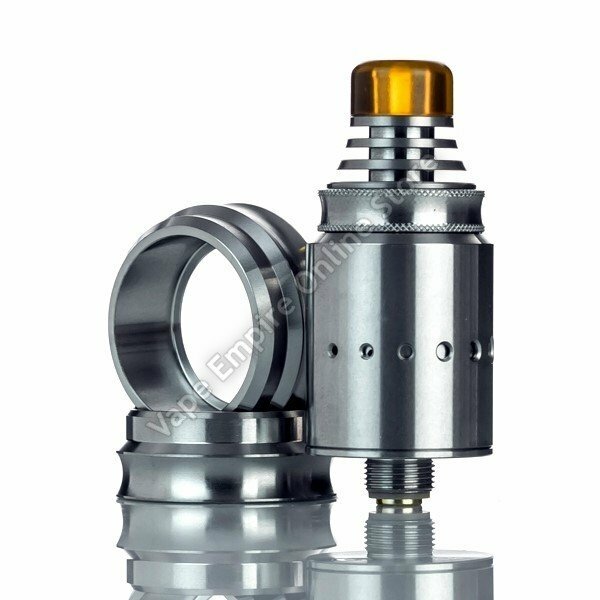 Vandy Vape introduces the Berserker Bottom Feed rebuildable atomizer, inspired by Alex from VapersMD, one of the best mouth to lung RDA's to give outstanding flavor. The Berserker RDA is a 18.1mm rebuildable tank and utilizes a 8mm juice well for your favorite E-Liquid along with six interchangeable internal airslots sizes ranging from 3.1mm by 0.5mm, three 1mm air slots, a 1.6mm, 1.4mm, 1.2mm, and 2mm. The outer airflow can be changed from increments of 0.5mm, 1.2mm, 1.4mm, 1.6mm, and 2mm. The build deck accommodates small builds that are typically used for mouth-to-lung. Along with the small build deck, four hooks are available for users to wrap their coils around them to prevent the coil from shorting. On the building deck are two 2mm wicking ports to saturate the cotton. The 510 Pin of the Berserker can be changed with a 510 squonk pin. The Berserker Bottom Feed MTL RDA by Vandy Vape creates optimal flavor recreation and great building functionality, making this one of a more versatile rounded mouth-to-lung rebuildable atomizer available today.